Spray six ramekins or oven proof individual serving dishes with nonstick cooking spray. In a large bowl, mash the sweet potatoes, milk, brown sugar, butter, egg, vanilla and salt until fluffy. Divide the mixture among servings dishes. 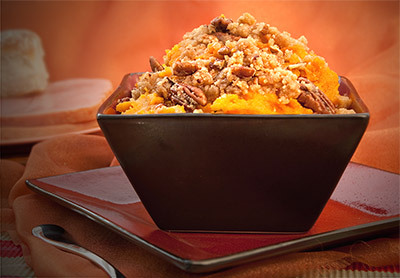 Combine 1/3 cup brown sugar, pecans, flour and 3 tablespoons melted butter until blended; sprinkle over the top of sweet potato mixture. Bake uncovered for 25 to 30 minutes or until golden.